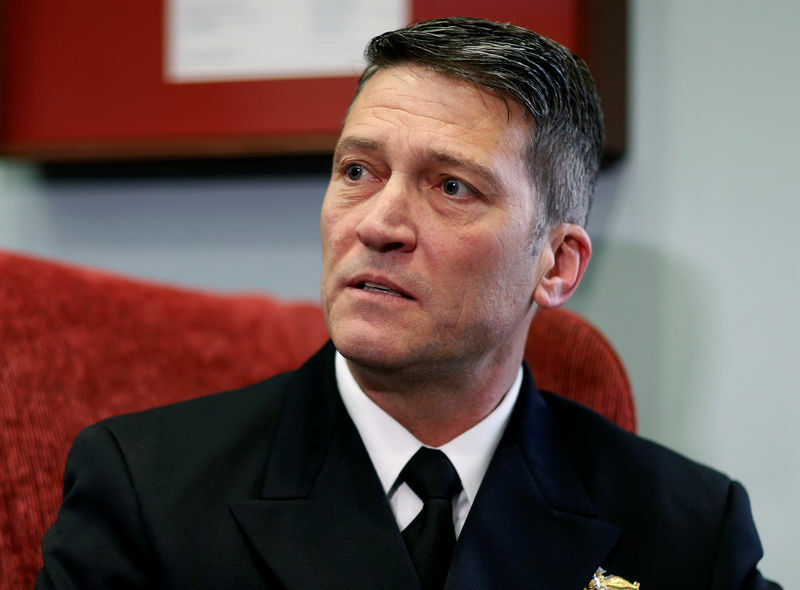 WASHINGTON (Reuters) – U.S. President Donald Trump’s physician Ronny Jackson, nominated to head the Veterans Affairs Department, met with White House officials on Wednesday night following a new round of allegations about questionable drug prescriptions and on-the-job drunkenness, a source familiar with the situation told Reuters. Jackson was weighing whether to proceed with congressional hearings or withdraw from consideration to lead the federal government’s second-largest agency, the source said. The controversy over his nomination is the latest in a long series of chaotic personnel issues for Trump’s White House. The meeting came after Democratic staff on the Senate Veterans Affairs Committee compiled a two-page document describing allegations made by 23 unnamed colleagues and former colleagues, most of whom are still in the military. The document, reviewed by Reuters, accuses Jackson, a rear admiral in the Navy, of prescribing himself medications, getting drunk at a Secret Service party and wrecking a government vehicle. The document also said Jackson once could not be reached on a work trip to provide medical treatment because he was passed out drunk in a hotel room. Jackson told reporters at the White House earlier on Wednesday that he did not wreck a car, saying he did not know where the allegations were coming from. The sprawling Department of Veterans Affairs has long been under fire for the quality of healthcare it provides veterans, a group that carries considerable political clout in America. During his election campaign, Trump vowed to clean it up. Jackson’s Senate confirmation hearing, originally slated for Wednesday, had already been postponed after senators from both parties said they wanted to examine allegations made by current and former colleagues to the committee. Even after reports about additional allegations emerged, Jackson told reporters earlier on Wednesday that he was moving forward with the confirmation process. Trump said on Tuesday it was up to Jackson to decide whether he would continue. The Iraq war veteran took on a higher profile when he gave a long and glowing news conference about Trump’s health in January after his first presidential medical exam. Trump fired his first secretary for the Veterans Affairs Department, David Shulkin, in March after concerns about unauthorized travel expenses. He surprised many by picking Jackson as the replacement, given that the White House doctor had no experience running a large operation. The White House defended its vetting process, saying Jackson’s background had been evaluated by three different administrations where he had worked closely with the presidents and their families. White House spokeswoman Sarah Sanders said Jackson had undergone four different background investigations, including a check by the Federal Bureau of Investigation, and had received strong recommendations from his superiors, including former President Barack Obama. But Sanders said the White House was looking at the new allegations. After she spoke with reporters, the Democrats’ document was released. It said Jackson was called “Candyman” because he would provide whatever prescriptions staff sought without paperwork. Sleeping pills and pills to wake up with were handed out on Air Force One “without triaging patient history,” the summary said. Jackson once provided a large supply of Percocet painkillers to a staff member without immediately recording the transfer, alarming the rest of the team about the sudden shortage. Trump’s White House has made combating opioid abuse one of its top priorities. Jackson was described as unethical, explosive, toxic, abusive, volatile and someone who would have “screaming tantrums” and “screaming fits,” the document said. People working with Jackson “noted a constant fear of reprisal,” and the document did not identify his accusers because of that, it said.